Hi all! Raise your hand if you love the dollar store. My hand is waving in the air in a "pick me, pick me!" fashion. I visited the dollar store the other day and thought I would let my closest peeps in on a few ways that these hack will make my life a little easier this week. 1. Limit the Hand Sanitizer to a small pump, rather than a bath. I use hand sanitizer in my therapy room when my students use the sensory bin to cut down on little germs hands spreading their love in the bin. I also use it if a student handles our hamster class pet. I picked up this hand sanitizer at the dollar store and added a Germ Blaster label. A simple hack to cut down on students pumping copious amounts onto their hands, which then overflows onto your floor is to wrap a rubber band around the neck of the pump. Now, students will get a small, appropriate amount to use. 2. 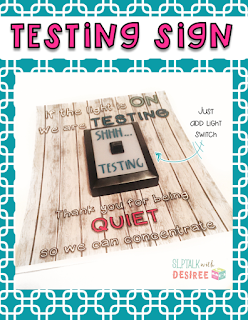 Attach a battery powered light switch purchased from the dollar store to the poster below to let those in the hallway know that you are testing or use to let others know not to disturb your small group. Download the posters here for free or click the image below. 3. Purchase small ramekin containers (available in packs of 10) to keep dice under control during game or independent work activities. Stop the insanity of dice flying everywhere by placing the die inside the clear ramekin container for a student to shake to roll. It is a simple trick that will surely save your sanity. What dollar store hacks have you tried lately? Let me know in the comments below or shoot me an email. I would love to hear from you! Just grabbed my hand sanitizer and threw a rubber band around the neck... genius!! !